Building your S38 engine is a very high cost proposition; the right components can make all the difference but high quality rods have always been cost prohibitive to the enthusiast. Help keep things together during extreme power output and high RPM with rods from SP Components. Many quality rods carry a price that can make your head spin, but not these. Comparable in price to "budget rods" for other engines, these rods use the proven H-bean pattern, ARP hardware, careful quality control, polished cheeks, a very good strength to weight ratio and overall quality the competition can't match at this price. Versus prepping stock rods, these rods already include ARP hardware out of the box and are very well balanced; saving you hundreds of dollars at the engine shop. Whether N/A performance is your goal or your looking to boost your Bimmer without breaking your budget, consider the SP Components rods for much greater strength than stock. 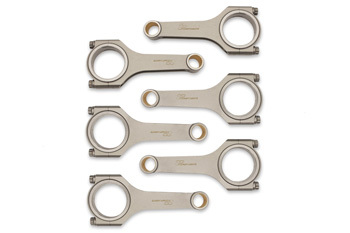 We find these rods to have the greatest cost to performance ratio available.